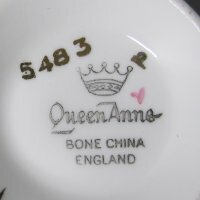 Vintage Queen Anne Gilt Wreath Bone China Tea Cup - Wonderful! FABULOUS QUEEN ANNE gilt floral wreaths with yellow, pink and blue flower accents. The tea cup foot and thumb rest are gilt. 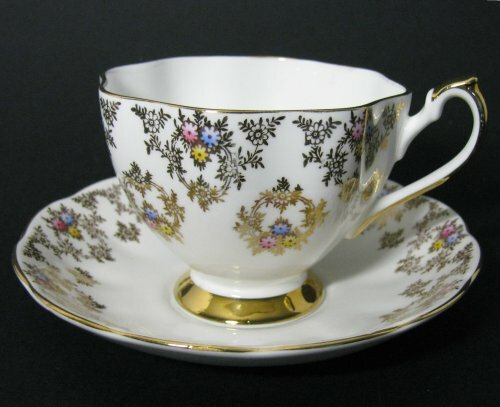 The cup pattern is wavy folds trimmed in gold. The gilt pattern seems different colors, but is actually reflecting the colors around it. There is one flower on the gilt wreath that appears smudged, but otherwise there are no evident issues with this beauty. The cup measures 2 3/4" high and 3 1/2" wide. 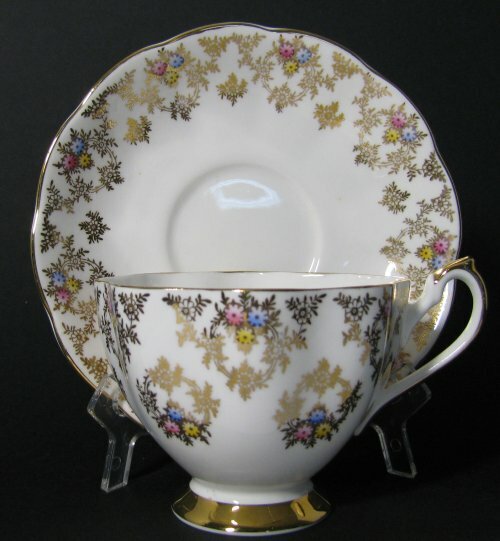 The saucer measures 5 1/2" wide with a slightly scalloped edge. WONDERFUL SET!